“Today’s Autumn Statement creates a new income rationing system for children, working families and disabled people through a national cap on their basic support. “The government is saying to Britain’s families and lowest paid workers that if employers don’t give them fair pay increases, they can’t count on tax credits to keep up with rising prices either. Disabled people and the poorest children are being told that their basic support could be rationed to balance the books. Once again, it’s the poorest who are being asked to pay down the lion’s share of deficit reduction. “For most families it’s the ‘Emperor’s New Recovery’ because their living standards keep getting worse and worse, so for them it’s invisible. The welcome extension of free school meals is great, but we were hoping the Chancellor would have good news for those struggling with the rising costs of childcare. They will have to hold out their hopes for another day. The following chart is from the Impact on Households document published by the Chancellor today. 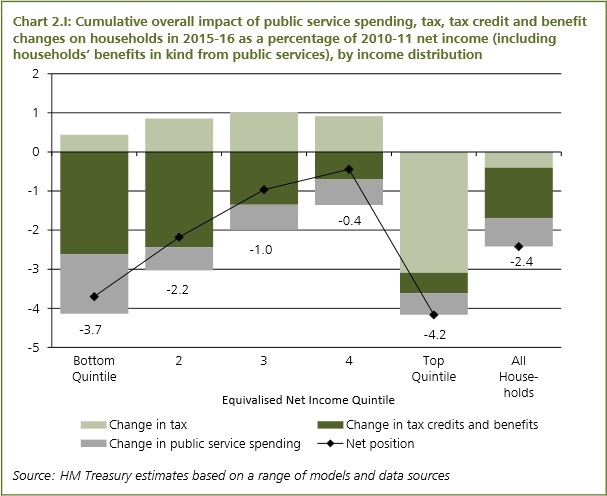 It shows that, aside from the very richest quintile, the cumulative effect of the Coalition’s spending decisions on tax, benefits and services is highly regressive. It is an admission that the government is balancing the books on the backs of the poorest. Improving support through child benefit.